Children have been a primary casualty of the devastating 2010 earthquake, which left approximately 250,000 dead and over a million homeless. As a result, there are an estimated 500,000 orphaned children. Le Fleur Orphanage is run by Madame LeFleur in Jerusalem, Haiti, and offers shelter, food and education to approximately 45 children. CE provides primary care services for these children. Prior to the earthquake, Madame LeFleur ran a small, successful hair salon in Port-au-Prince. She lived with her husband and son in Port-au-Prince. They took care of a handful of homeless children, providing them with food, shelter and a loving home. Unfortunately, the earthquake destroyed their home and business, leaving the family with nothing. Madame LeFleur's husband and son relocated to the United States, leaving her in Haiti to care for the orphans she had adopted. Madame LeFleur, and the orphaned children in her care, relocated to Jerusalem, Haiti in the aftermath of the earthquake. For over a year, they lived in ragged tents, exposed to the elements, and lacked a consistent source of water or food. Madame LeFleur worked to secure services from local pastors and international relief funds. Today, she cares for over 40 children, some of whom are orphaned and some simply cannot be cared for by their parents. Community Empowerment (CE) and The Global Health Program at Rush, through private donors, were able to provide Le Fleur Orphanage with a gated cinderblock home where the children can learn and play. In addition, we constructed a well to provide consistent clean water. Our healthcare workers also provide regular, basic checkups. Our ongoing donations help support much of what the children receive. Our medical trips to Jerusalem always include a stop at the orphanage, where the traveling artist engages the children in an interactive art project. The goal is to infuse our commitment to art with their curriculum. 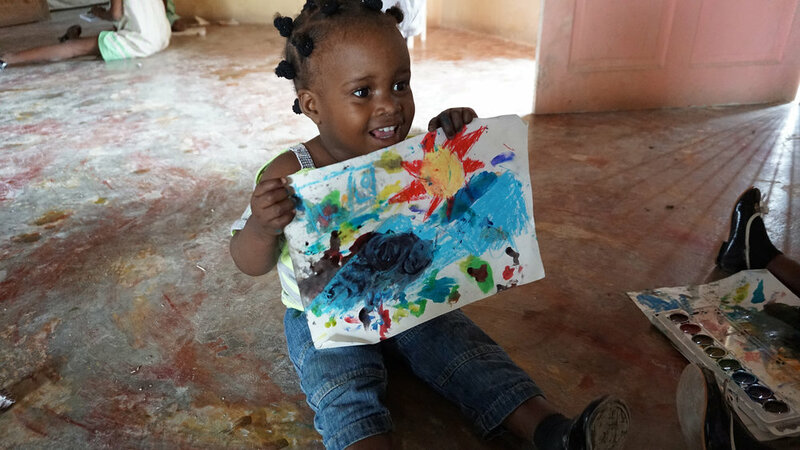 In 2015, Hague Williams taught the kids about painting, leading them on an exploration of their artistic vision. The older kids worked on self portraits while the younger kids were able to explore the use of paint. The kids were able to keep their creations. In 2016, Annie Grossinger provided the older kids with a set of digital cameras with instructions to photograph their surroundings. The kids spent time learning how to use a camera, photographing each other and themselves. The photos were printed overnight and provided to the kids the next day. A couple cameras were donated so they could continue their exploration. In 2018, a team constructed a playground for the children, complete with swings, monkey bars and a teeter-totter..